Early literacy skills don't only happen once your child is enrolled in and attends a school. They are first learned in the home, as young as 3 years old. At 3, your child should have developed key skills that will one day enable her to become proficient in language and reading. A study by Carolyn Chaney, specialist in Language and Social Interaction for San Francisco State University, and published in the "Journal of Applied Psycholinguistics," confirmed that early language skills are the best predictor of your child's success in literacy and metalinguistic awareness in the future. At age 3, your child has the capacity to recognize letters on sight. By 4 years of age, 43 percent of children are proficient in recognizing letters by their shape, according to the National Center for Education Statistics. Helping your child sing the alphabet song, writing out letters of the alphabet for her and talking about each one should help your 3-year-old become more familiar with the alphabet. Helping your 3-year-old recognize letters and understand what sound each makes can prepare your child for reading. Give him games to play to learn about the sounds in the alphabet, like saying a word and allowing him to guess what letter it starts with, or locating items around town that start with a certain letter. One day those skills will help him to read his first book. At 3 years old, your child should easily be able to recognize her own name. Although it may involve memorizing the order of letters more than reading or spelling, helping your child recognize her name spelled out gives her a rudimentary knowledge of certain letters and their sounds. Write her name on a piece of paper, or spell it out on a plaque for her door so that she becomes interested in the personalized use of her name. Lightly draw outlines of letters to have your child trace over, or help him to spell his own name. Your 3-year-old likely won't be able to write much more than his name, but this is a good start for future writing skills. Learning how to hold a pencil properly and form letters into a word, even if it doesn't make sense, sets your child on the right path to literacy. A 3-year-old thinks she is reading when she memorizes the words and the way they look in a familiar book and can point them out from memory. You may dismiss this as memorization, but your child is actually showing word recognition. Reading familiar books can teach her sight words and patterns that often go together. 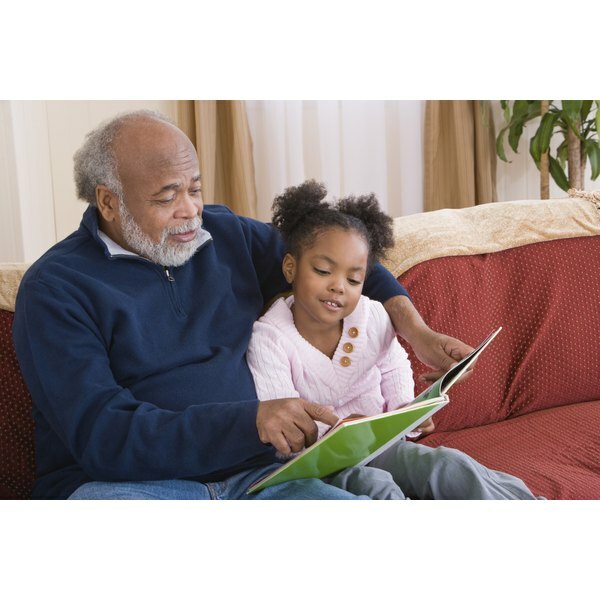 A literacy-rich environment of reading books, saying words and identifying letters can help her one day turn her word recognition into actual reading as she becomes comfortable with word patterns and isolated letter sounds, notes the American Speech-Language-Hearing Association.